A week after Cyclone Idai struck the coast of Mozambique near Beira, there are still people awaiting rescue from treetops and roofs. The death toll, with confirmed deaths numbering in the high hundreds, is still unknown, with the largest number in Mozambique, and still devastating numbers in Zimbabwe and Malawi as well. The full impact has been slow to emerge, but it is finally gaining more attention from world media. This AfricaFocus Bulletin contains excerpts and links under three topics: strategic ways to contribute, sources for updates, and the issue of climate change and climate justice. For quick overviews of the situation, check out these short videos. This list is selective and far from complete. If you know an international relief organization that you trust, it is likely that they are there by now. And, if you have contacts with other organizations working on the ground, you may want to use those channels. These are a few strategic suggestions, taking into account the ongoing need to strengthen organizations that dealing not only with the immediate crisis but with recovery and preparation for the next crises. The United Nations has an essential role in response to emergencies. Its coordinating body for this is UNOCHA. A group of volunteers in Maputo, who as of yesterday had coordinated collection of goods for Beira and packed them into containers (approximately 700 tons) that will depart for Beira by ship tomorrow. International bank account transfers can be difficult and expensive, particularly from the United States. But a new on-line service makes it much more convenient, and can be done with a credit or debit card. In addition to the bank details above, one also requires a mobile phone number for the recipient to be notified. See the instructions for Mozambique, Zimbabws, and Malawi at the following links. In the reason for the transfer check family or friend support. Nearly a week since Cyclone Idai struck three of the most vulnerable countries in Southern Africa, needs are rising and humanitarians still don’t have a full picture of the extent of the disaster. Aid access is one of the biggest challenges and cholera is a major concern. More than a million people in Malawi, Mozambique, and Zimbabwe have been affected by what the UN called a “massive disaster”. Its emergency aid coordination body, OCHA, said “the situation is likely to deteriorate, and the number of people affected is likely to increase”. Mozambique was the first country hit. Some reports estimate 90 percent of Beira, the fourth largest city, with more than 500,000 residents, may be damaged or destroyed. But Médecins Sans Frontières said “it’s still too early” to have a complete overview of the situation as many areas remain cut off and inaccessible by road. Rain and heavy winds continue, so reaching certain areas by air or sea is a challenge. The storm also destroyed most of Beira’s telecoms infrastructure, making it difficult to get word out of the affected areas. Here’s a round-up of what we know about the humanitarian needs and response. What is the scale of the disaster? 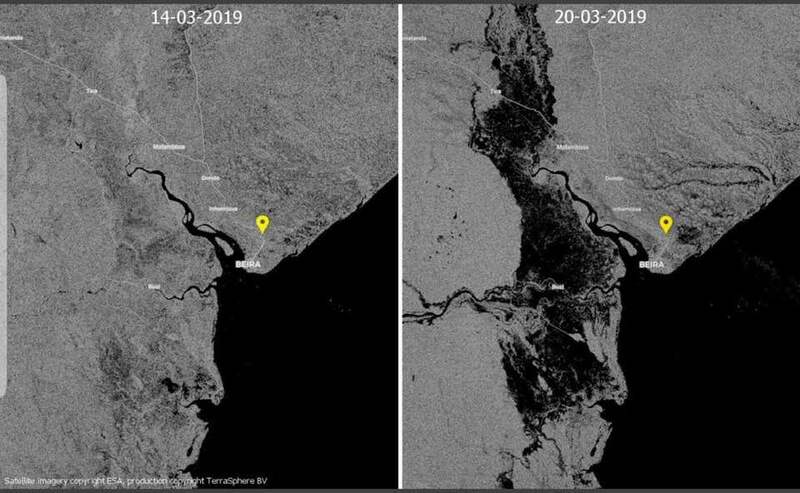 Late on 14 March, Cyclone Idai made landfall off the coast of Mozambique, before continuing to Zimbabwe and Malawi, causing widespread devastation across parts of the three countries. 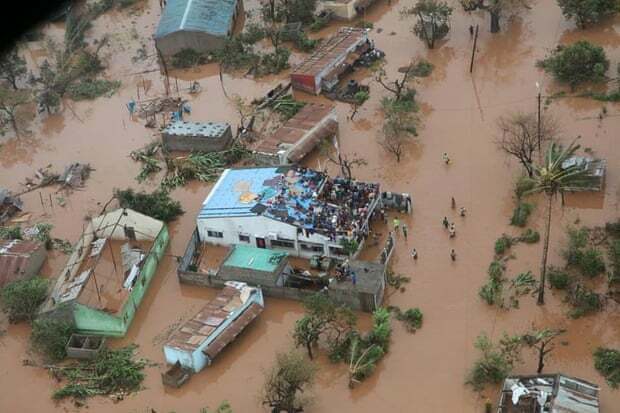 The scale of damage in Mozambique is “massive and horrifying”, the International Federation of Red Cross and Red Crescent Societies said. Tens of thousands lost their homes; roads, bridges, and crops were washed away; and people remain trapped on roofs awaiting rescue as parts of Beira are still under water. More than 100,000 people needed emergency evacuation in Beira and surrounding areas in Buzi District. Although the official death toll is just over 200, Mozambique’s president estimated more than 1,000 people may have been killed. So far, 1,500 are injured and 17,000 displaced. In Zimbabwe, floods destroyed 600 homes, affecting an estimated 15,000 people. So far, more than 100 people have been reported dead, 200 are injured, and another 200 are still missing. Malawi has reported 57 dead and more than 500 injured. More than 94,000 people are estimated to have been displaced and some 840,000 people have been affected, according to the government. 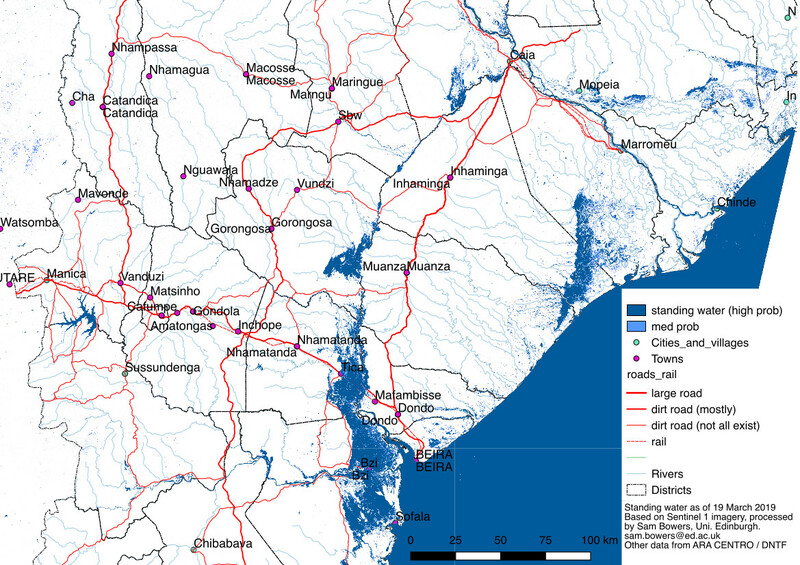 Although water levels have subsided a bit in Zimbabwe and Malawi, flooding continues in Mozambique and hundreds of thousands remain at risk. There are also growing concerns about the overflow of the Marowanyati Dam in Zimbabwe, which threatens to increase water levels in Mozambique. Heavy rain and flooding before the cyclone hit had claimed more than 120 lives and affected 1.5 million people in the region, the UN said. Malawi and Mozambique are both prone to extreme weather events, such as the floods that left hundreds dead in both countries in 2015. While parts of Zimbabwe are under water, other parts are in the midst of El Niño-induced drought, which has caused a severe food crisis. 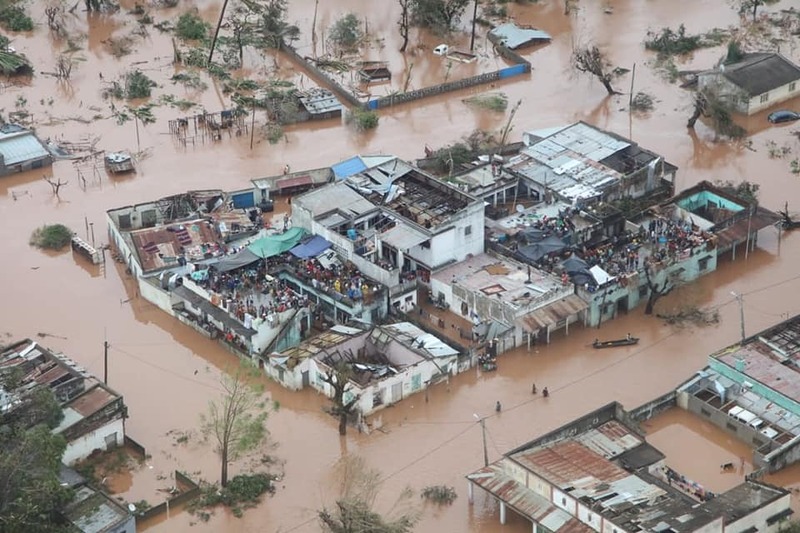 The World Food Programme estimates that 1.7 million people in Mozambique alone were along the path of the cyclone when it hit. MSF described the scene as “destruction – and a lot of water”, saying that electricity, telecommunication lines, and main roads leading into Beira remain cut off, with houses and buildings submerged, and hospitals severely damaged. Search and rescue operations are continuing, but many people remain unreachable. Those who made it out of affected areas are living informally in schools, churches, or sometimes just out in the open, where they face the risk of respiratory infections and other diseases. With people exposed to the elements “all the small problems will become big problems”, MSF’s Rose said. In Nsanje, one of Malawi’s worst-hit districts, “houses fell down completely or partially, and a lot of toilets and kitchens went down,” said Ilse Casteels, MSF’s head of mission in the country. “Because of the floods people moved to higher areas, regrouping in churches and centres and schools. For the moment there are a lot of families staying there,” she said, even though some people have returned home to start rebuilding as the flood waters recede. In Malawi and Zimbabwe, people lost their homes but also their livelihoods when the floods destroyed their crops. Many of those affected in Zimbabwe’s eastern highlands are small-scale farmers, Mercy Corps’ Makore said. As a result worsening food security will be a major concern in the months ahead. An estimated “200,000 are in need of urgent food assistance for the next three months in Zimbabwe,” the WFP said, with Chimanimani the hardest hit. UN agencies, local and international aid organisations, and foreign countries have intervened or sent funds to assist the humanitarian response. Many others are in the process of raising donations. The WFP aims to provide food assistance to some 600,000 people in Mozambique and 650,000 people in Malawi. MSF is providing emergency medical care in affected regions and, in Mozambique and Malawi, it has prioritised continuity of care for vulnerable HIV and tuberculosis patients who were being treated before the disaster struck. In Zimbabwe’s Chimanimani district, where severe flooding wiped out roads and bridges and left the area accessible only by helicopter, the International Rescue Committee has set up a mobile clinic and is distributing food and specialised kits for women. Mercy Corps has been focusing on water, hygiene, and sanitation services. In Mozambique, the Indian Navy and the South African Air Force have been assisting the government’s search and rescue operation. Meanwhile, aid organisations are estimating a long road to recovery. The World Health Organization is sending three months’ of supplies for 10,000 people. CARE is working with the government of Mozambique to provide seeds and livestock to replenish farms that have been decimated by flooding. The UN’s Central Emergency Response Fund, known as CERF, has allocated $20 million to ramp up the humanitarian response across the three countries. The UK is donating almost $24 million, the EU close to $4 million, and the African Union $350,000. Tanzania said it was sending urgent relief supplies, including tonnes of medicine and food. What are the humanitarian needs/gaps? Access to potable drinking water, shelter, food, and healthcare are the priorities, aid groups say, with water, sanitation, and hygiene needs particularly urgent as the risk of waterborne diseases is the major concern across the board. Zimbabwe has been in the midst of a cholera outbreak since last year. Mercy Corps, which has been assisting with the response, is concerned that recent events will worsen the crisis. “Our major concern is that the water bodies have been contaminated, because the latrines have been destroyed,” Makore said. “We are concerned because there can be an ensuing disaster following that, related to the waterborne diseases,” including cholera and typhoid, as well as malaria. “We have to make sure the affected population has access to clean water,” she said, adding that a lot more support is required to help those affected in Zimbabwe - from immediate lifesaving aid to longer-term support for communities who will need to rebuild. In Malawi, MSF’s Casteels said the most urgent need is clean, potable water, after many boreholes were affected by the flooding. She also expressed concern about cholera and malaria spreading in the coming weeks. What are the longer-term issues? Mercy Corps’ Makore said the priority should be resiliencebuilding for affected communities. “Contextually, for Zimbabwe right now, we have got two natural disasters at the same time. The El Niño-induced drought and now this [flooding]... Whatever produce was available was washed away, and livestock was also washed away,” she said. Based on the aftermath of previous disasters that have affected Mozambique, MSF’s Rose said: “it will take years to rebuild the town [of Beira]”. “This will have the worst impact on those most vulnerable,” she said. “It’s those who have small, fragile houses that are worst impacted, as they are always the people without the means to build a new house. So it’s a vicious cycle. Those who have no means to rebuild will be left outside with no house, more at risk of disease and worse off." "The situation is already complicated and it will continue to be, especially for the most vulnerable,” she said. In Zimbabwe, already confronted by a host of humanitarian, economic, and political challenges, Cyclone Idai has only made the outlook more bleak. “The priority is to help get people back on track and restore some level of dignity and hope,” said Makore. 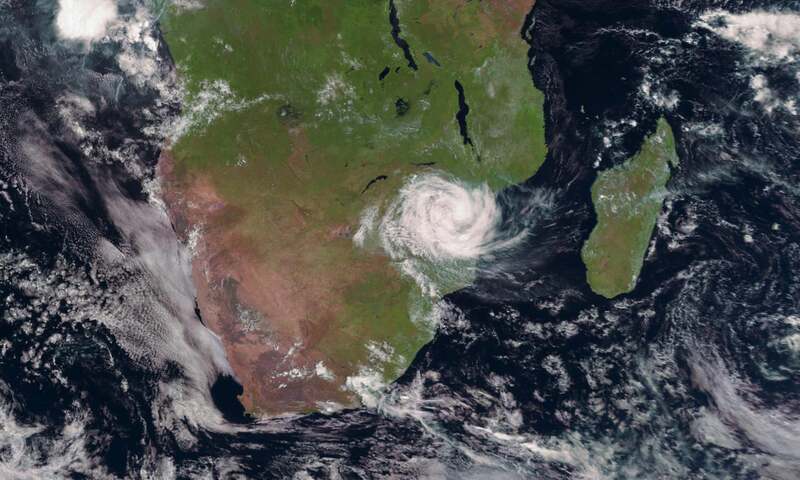 Cyclone Idai is sweeping across Southern Africa with Mozambique and Zimbabwe being the hardest hit. More than 200 people have died across the region since the storm hit on 4 March. In Zimbabwe Chimanimani district is the hardest hit, with more than 65 people confirmed dead as of Sunday 17 March whilst hundreds are still missing. Hundreds of homes were swept away whilst road infrastructure was destroyed, rendering Chimanimani inaccessible for rescue efforts. Whilst human life is beyond monetary value, the loss in terms of damage to property can reach billions of dollars, and some of the families may never recover from their loss unless they are properly compensated. And yet the big question is who must take responsibility for compensating the affected people? The link between extreme weather events and climate change can no longer be disputed. Climate change, being a culmination of unrelenting emission of greenhouse gases, mainly by the industrialized rich countries, is responsible for the disaster unfolding in Zimbabwe, Mozambique and Malawi – countries with among the world’s lowest emissions rates. However, whilst rich countries have enough resources to cushion their populations from some of the extreme effects of climate change, poor countries have limited resources to cope with climate change-related disasters. Had there been enough adaptation resources, a significant number of lives could have been saved. Many were washed away whilst sleeping in their homes in the dead of the night. Whilst the benefits of greenhouse gas emissions are enjoyed by the rich countries, the poor countries are on the receiving end of deleterious effects of climate change. Sadly, given the reluctance of rich countries to take drastic action towards carbon emission reductions, natural disasters are set to increase resulting in more loss of lives and property in the poor countries. Sadly majority of the victims have no idea as to who is chiefly responsible for their calamities. The situation unfolding in our region is of global significance. It is a consequence of human action and those contributing more to climate change ought to compensate the victims. The Centre for Natural Resource Governance is of the view that the rich countries must pay their climate debt to the Zimbabwean people – but the Zanu PF government and Minister Mthuli Ncube cannot be trusted to manage the payments. Instead, we need trusted agencies in civil society to receive aid and direct transfers to the ordinary people affected. This could be done simply by arranging payout systems in the affected parts of Zimbabwe, so that everyone living in those areas would get a reparations payment. There is need to compensate families for loss of lives, destruction of homes and even loss of food, livestock and domestic utensils. The situation is dire in fragile states where governments have misplaced priorities which relegates human security to humanitarian work of Non-Governmental Organisations and well-wishers.